Recently we had the chance to catch up with Stephane Bergara, the leading lady working to keep music and musicians an important part of Austin’s economy. And for those not in the know, she’s also the frontwoman for the Selena Quintanilla Tribute band, Bidi Bidi Banda. In her role as the Music Programs Specialist, City of Austin Economic Development Department, Music & Entertainment Division she does a variety of work, including citywide music communications, musician proclamations, and partnerships with HOPE Farmers Market, Dub Academy and the Austin Music Foundation. 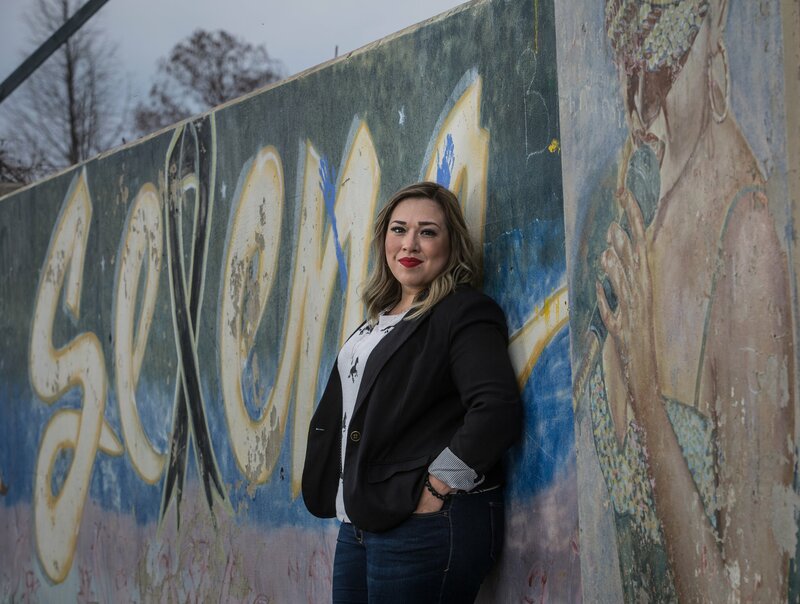 An Austin native, Stephanie has 10 years of experience in the music industry, and attended the University of Texas at San Antonio where she studied Political Science and Latino Cultural Expressions. Her career took off with a two year stint in San Francisco at booking agency High Road Touring, and has had momentum with music industry leaders like Giant Noise, Lollapalooza, and Austin City Limits. Stephanie is a member of the Artist Relations team at Austin’s Pachanga Latino Music Festival and has worked most recently with the Austin Latino Music Association. Get to know more about how Stephanie lives through music! 1.) How do you define the economic and cultural impact of the music scene in Austin? To you personally what did it mean to grow up in a town so music-centric (given that you’re a musician)? Talking about Austin without bringing up music is like having the Super Bowl without the football game. The cultural and economic impact of music in this town is without comparison. I have the unique good fortune of being a native Austinite, a working musician, and via my work, an advocate for the musicians and music industry professionals of this great city. In my various travels, I’ve found that no place invests in healthcare, education, and promotion of its hometown musicians quite as well as we do. Events like the upcoming 10th Anniversary of HAAM Benefit Day and countless other hyperlocal events have contributed to helping mold the globally recognizable music hub Austin is today. 2.) Given the recent music census, how do you think Austin has to change to continue to keep this up? What would it mean to the city if there’s no way to stave off the affordability issue & musicians leave? I see this time as an opportunity for Austin to make a significant investment in keeping music here. Losing music in Austin entirely would be a crushing blow, one that I don’t think we’d ever recover from. I don’t feel that we are in a crisis of losing music in Austin entirely, but by working together, and formulating a plan to support industry infrastructure, we are ensuring a long and prosperous future for music in Austin for years to come, but it’s going to take all of us. 3.) What are some things your office is going to do to try to stave off the exodus of musicians to a more affordable music hub? What are some ideas you have on that topic? In my opinion, the day that the survey results were released was the day that the Austin Music Office collectively rolled up our sleeves and got to work. The content of this report exposes the issues affecting Austin’s music community louder and in larger numbers than ever before. We’ll be holding a series of upcoming stakeholder meetings and work sessions to engage our community partners in solution-based planning for addressing the key issues facing Austin musicians, industry professionals, and venue owners. Our work didn’t end with the release of the census report, it is only beginning. 4.) What are a few things folks in town can do to ensure that any music-related stuff they do goes off without a hitch (via your office)? Our goal, always, is to make sure that the citizens of Austin have the information they need to host a safe successful event. Our office is located within the Austin Center for Events, home base to the multiple special events units of city departments including fire, police, transportation, code compliance, etc. It has certainly been an eye opening and rewarding experience for me to work closely with the individuals who lend a hand in logistics of Austin’s thriving event culture. I would encourage anyone who needs clarification on guidelines, deadlines or permit requirements to give us a call at the ACE offices — there is never a permit required for asking a question or trying to get clarity. 5.) What are 3 changes you’ve noticed since you started working in this role in the Austin music community (more Latino bands, more people from other places, etc.)? Austin is a special events town and (most) locals love and embrace it: I can’t think of one weekend in the year when there isn’t at least one special event happening. While everything isn’t for everyone, between Texas Veg Fest, Austin Film Festival, Texas Longhorn Football, Pecan Street, Austin Chronicle Hot Sauce Fest, The X Games and The Austin Marathon to name a few, if you live here, you can’t help but find yourself getting in to something at least once a year, if not more frequently. Austin is growing and people are moving here at an astronomical rate: Austin is the Capital of cool! It’s never been more apparent to me that the world loves Austin, and that people, educated millennials, families, musicians and others are trying to get here as fast as they can. The growth will never stop, but we can collectively work to accommodate our ever expanding population. International music is here, and it’s here to stay: events like SXSW, Pachanga Latino Music Festival and WoBeOn Fest have ushered in a tidal wave of international interest among music patrons in Austin. This town is home to an incredible range of musicians, from middle eastern jazz trio Atlas Maior to traditional Mexican Son Jarocho Group Son Armado. We have an African Marimba Drum School run by Rattletree Marimba, and Russian folk quintet Flying Balalaika Brothers who also call Austin home. This is certainly a cliché, but there is something for everyone here — and the international flavor will continue to grow. I’ve always believed that musicians deserve respect, that making music for people has great value, and that artwork is work. As I got older and gained more experience in the fields of booking, publicity, marketing, management and festival production, I was able to have a more full understanding of the tireless work that countless people do to keep the music industry machine going. My hope is that my work can continue to support this incredibly talented and invaluable music community, everyone from the lead vocalist to the Audio engineer, for years to come. I hope that my contribution has a lasting positive impact on Austin. Follow Stephanie on Twitter and Instagram (@bidibidibergie).